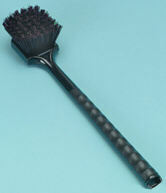 The thick 2" long, poly bristles on this scout brush work great for general cleaning of the fireplace and smoke chamber. The handle is 16" long. The scout brush is also perfect when using Brick and Mortar cleaner for masonry cleaning jobs.